6131CLCantata Clear Glass Table Lamp, White ShadeA..
72802An impressive table light comprising of a dec..
73753A table light in an antique brass effect fini..
73749A table light in a polished chrome effect fin..
72860A simple yet elegant table light made from ma..
Alta Modern LED Table LampSimple, Stylish A f..
ALTESSE-TLNIA 2 light table lamp finished in polis..
71621The Andromeda table light is a stylish fittin..
1026BRBark Table Lamp, Wash Brown Base, Oatmeal Sh..
1026GYBark Table Lamp, Wash Grey Base, Oatmeal Sha..
1142PWBedford Table Lamp - Pewter Stud Detail Base..
72887A simple yet elegant table light made from ma..
4318CC-1Bravo Table Lamp - Pillow Stacked Black/ch..
4547GOBrookside Table Lamp - Ceramic Hammered Gold..
1021Cadence Table Lamp - Neutral Ceramic Base, Hes..
9000Calven Window - Dark Wood Square Table Lamp Cw..
CANNING-TLCHThe canning table lamp is finished in ..
73570The modern, geometric design of the Cassier t..
9052CCCatalina 1 Light Table Lamp, Chrome, Smoked ..
0371BKChequered Cube Table Lamp, Mirror/blackThe s..
1064CCClayton Table Lamp, Mirror Tiled Base, White..
3054CCClef Music Clef Table Lamp, Black ShadeBoast..
2111CCClover 2 Light Led Column Table Lamp, Clear ..
7923CCClub Table Lamp, X Base Chrome, White Rectan..
7923SSClub Table Lamp, X Base Satin Silver, Black ..
TL4211-6997 - White With Pattern Lamp BaseThe TL42..
CORVINAA walnut coloured, wooden table lamp finish..
1514CCCoventry Table Lamp Chrome Rings With Silver..
4081CC-1Cusion Table Lamp - Curved Rectangle, Chro..
DALSTON-TLABThe Dalston table lamp has an antique ..
69520A sleek dual purpose table light finished in ..
67517A sleek dual purpose table light finished in ..
1065Dazzle Table Lamp, Cracked Mirror Effect Base,..
3401CLDerby Table Lamp - Clear Ribbed Glass Base W..
1011ABDrum 1 Light Table Lamp, Antique Brass, Line..
4562-2CRDrum Pleat 2 Light Table Lamp, Cream Pleat..
4562-2SIDrum Pleat 2 Light Table Lamp, Silver Plea..
6550CC-1Drum Table Lamp - Chrome Base, Ivory Drum..
3411SMEdition Table Lamp - Smokey Ribbed Glass Bas..
8531AMElina Table Lamp Large Glass Urn, Amber Glas..
8531SMElina Table Lamp Large Glass Urn, Smokey Gla..
96930-TLCHThis table lamp features an unusually sh..
72425This Evelyn table light has a rotating arm de..
4563BRFairview Table Lamp - Ceramic Brown Matt Bas..
4023ABFlemish Table Lamp, Spindle Base, Antique Br..
EH-FORBES-TLThis table lamp features tan leather s..
8221-1SSFretwork - Table Lamp, Shiny NickelThis Mo..
9064CCGlenmont Table Lamp - Chrome Ridged Base, Si..
1024CCGrange Table Lamp - Silver Etched Base, Whit..
3721CLGreyson Table Lamp - Clear Glass Urn Base, P..
3721AMGreyson Table Lamp Amber Glass Urn/with Brow..
69902The pale grey crackle glaze base of the ceram..
72749A 2 light table light with an antique brass f..
72747A 2 light table light with a polished chrome ..
71591The Indara table light features a hammered ag..
IRIS-TLCRA cream ceramic table lamp with crackle g..
72389An elegantly arched table light finished in b..
KEW-TLGOA gold tinted glass lamp complimented by a..
71634This swing arm table light has a glass surrou..
70182The Lacy table light features a clear glass s..
EH-LEAF-TL-SA small polished table lamp finished i..
EH-LEAF-TL-LA large polished table lamp finished i..
70600Beautifully simple table light with a clear g..
68802Beautifully simple table light with a clear g..
LULLABY-TLCRA table light with intricate flower de..
MARSHAM-TLIVA wooden table lamp finished in an ivo..
MARSHAM-TLTAA wooden table lamp finished in a taup..
72803Eye catching table light comprising of a meta..
5110BKMirror Table Lamp Mirror Finish on Black Woo..
1610BKMirror Table Lamp - Tall Black Mirror & Faux..
1610Mirror Table Lamp - Tall Mirror White Faux Sil..
MORETOThis table lamp has a tapered chrome effect ..
96940-TLCHThis table lamp has a polished chrome fi..
NERINOThis large cast metal oval table lamp with a..
4552CCNetwork Table Lamp - Chrome Cut Out Decorati..
70564A 2 light table light finished in a brass eff..
60804A 2 light table light finished in a bright ni..
68492An oval shaped table light finished in a sati..
68846An oval shaped table light finished in a sati..
5141ABPedestal Table Lamp - Glass Column & Antique..
5141SSPedestal Table Lamp - Glass Column & Satin S..
61192The Piccadilly is a stylish table light with ..
61191The Piccadilly is a stylish table light with ..
EH-PINEAPPLE-TLThe Pineapple table lamp features a..
5678CCPlatt Led Table Lamp, ChromeMake a statement..
6086CCPlexus 1 Light Table Lamp, Mesh Shade, Black..
0195-DWThe Portal table lamp mixes dark wood with ..
4543BWPuzzle Table Lamp - Ceramic Dark Blue Brown ..
EH-RASKIN-TLSingle light desk lamp with flexible h..
2812RURibbon Led Twist Table Lamp, Rustic Black/go..
3122CCRings Led Table Lamp, Chrome, Clear CrystalC..
70102This decorative table lamp has a secret gard..
Table lamps are a very popular range as they add to a room's atmosphere and help with everyday chores and hobbies such as reading a book, viewing a magazine, with cleaning up, making a keyboard visible for typing, finding lost objects and much more. Our range is extensive in this aspect, we have only chosen the best to display and sale. 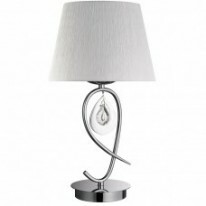 Table lamps make up 80% of our prize give aways! When we hold competitions there is a large chance that it will be a table or desk lamp... so keep watching this space! If you need help in your choice please contact us and we will be happy to help find your perfect one.